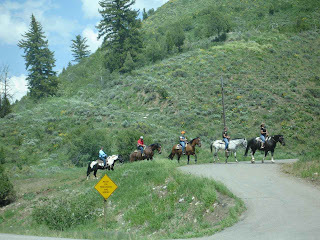 We leave Bear Lake in Utah and head up the eastern shore. Rejoining Route 89 it's a scenic drive all the way to Jackson, Wyoming and the Grand Tetons. This is mountain country, river country(the Snake River), and horseback riding country. Almost any outdoor activity is featured here. Jackson is home to some serious mountain and rock climbing schools. 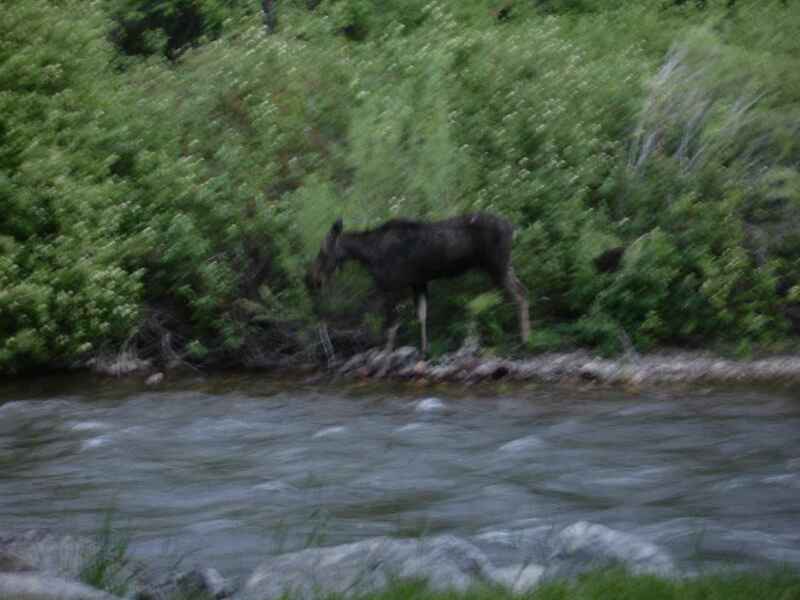 We are in bear, deer, moose, and bison country. There are 2 families of moose that are making daily appearances here in Gros Ventre campground in Grand Tetons NP. There are some pretty, but small towns on the scenic route. Some boast populations of about 100 persons. 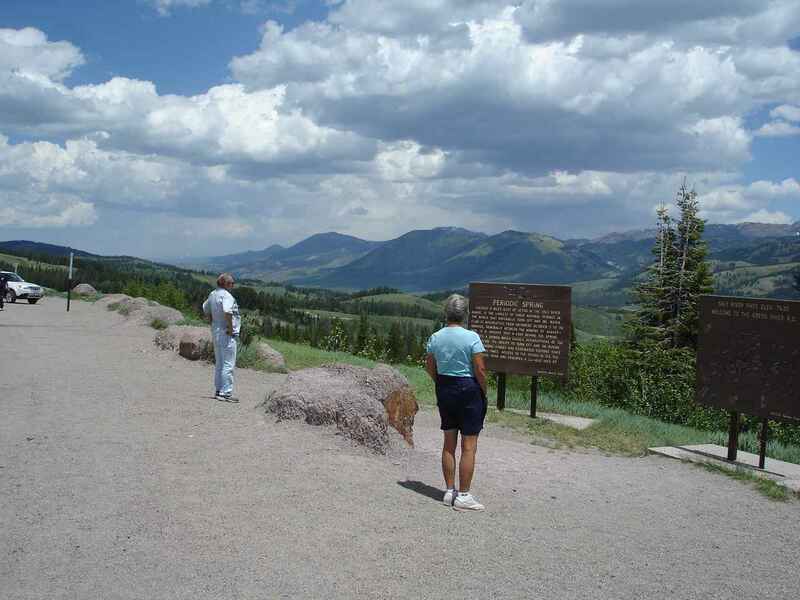 This is at the Salt River Pass. The Oregon Trail was followed by thousands in the 1800's . 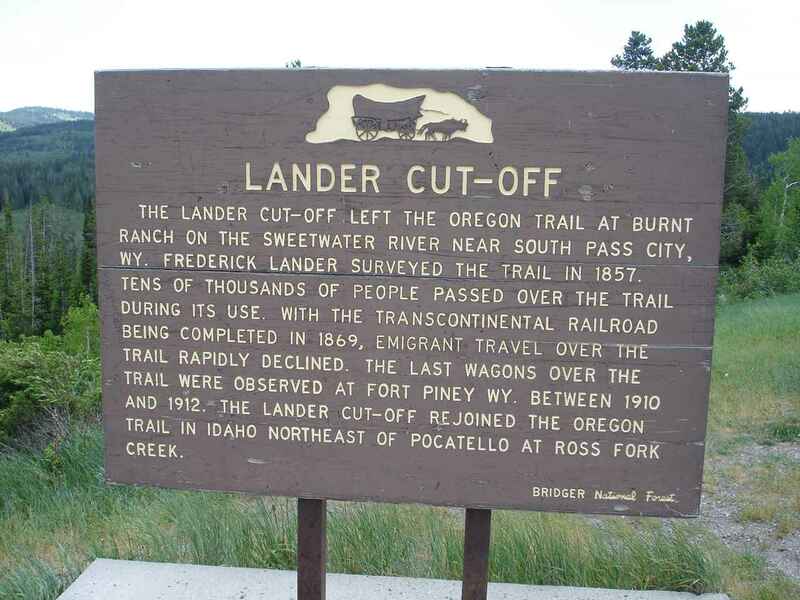 This sign mentions a cut-off that was used by tens of thousands between 1857 and 1869 when the transcontinental railroad was completed. We remember a software program called Oregon Trail developed in 1971 but became popular in 1981 for Apple II computers. Developed by a history student teacher to teach students about the push west. 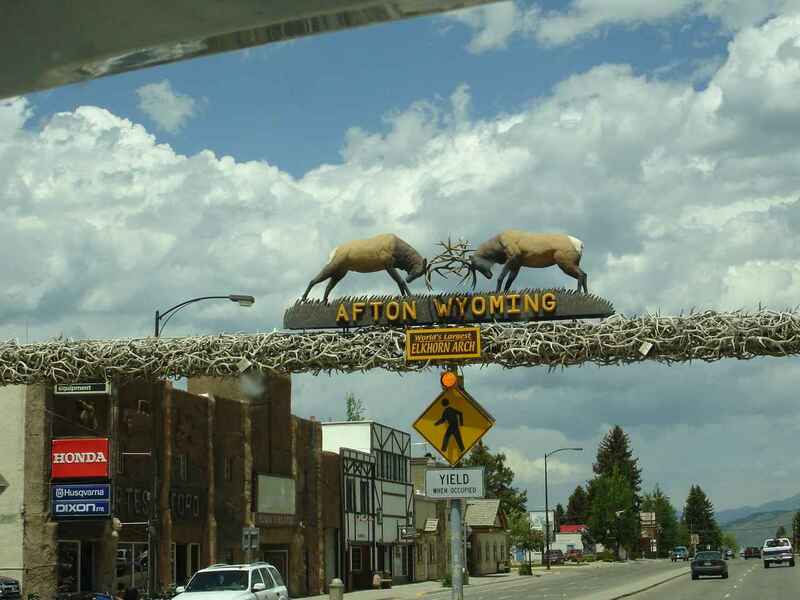 One of the small towns is Afton, Wyoming. 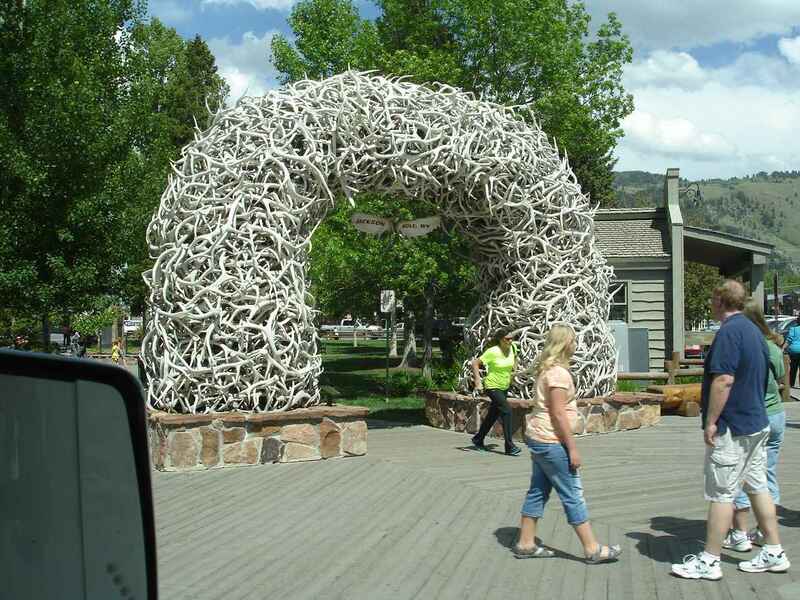 You can see that they are quite proud of this largest elkhorn arch. Passing over several sections of the Snake River, we can see a number of rafters enjoying the river--running at a pretty good clip. Each raft seems to have 8 persons plus a guide in the back. 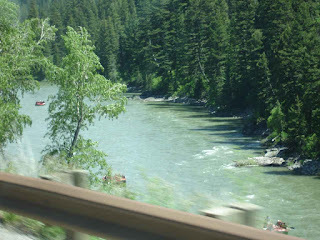 Sean remembered taking some students on this river, he thought also in Wyoming. 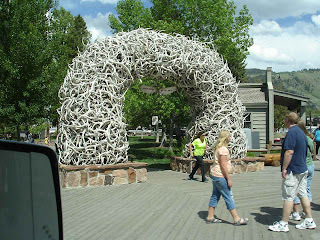 Even Jackson Hole, Wyoming likes its elkhorn arch at the entrance to one of its parks. 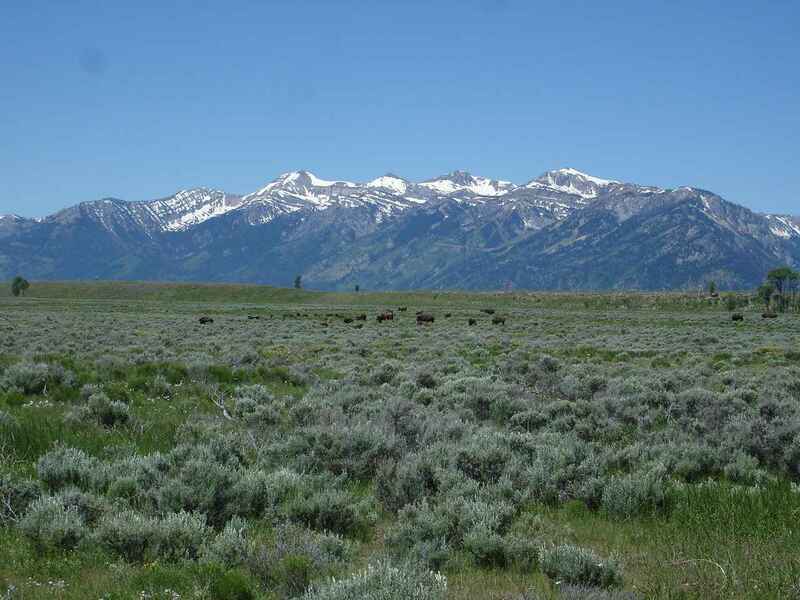 Just north of Jackson we enter the Grand Teton National Park. 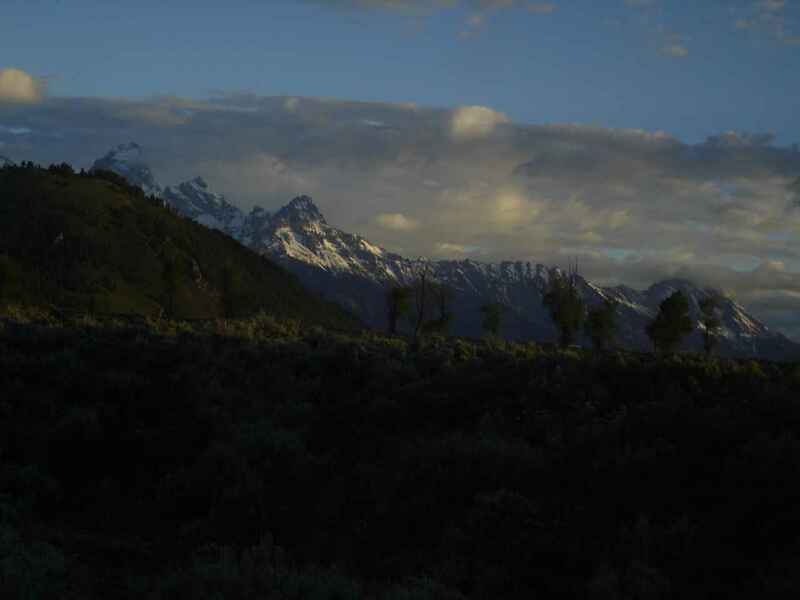 From Gros Ventre road, near our campground, is this view of the Tetons. 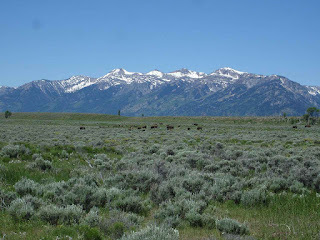 If you double click to enlarge the picture, you will also see part of the herd of bison that we see daily. 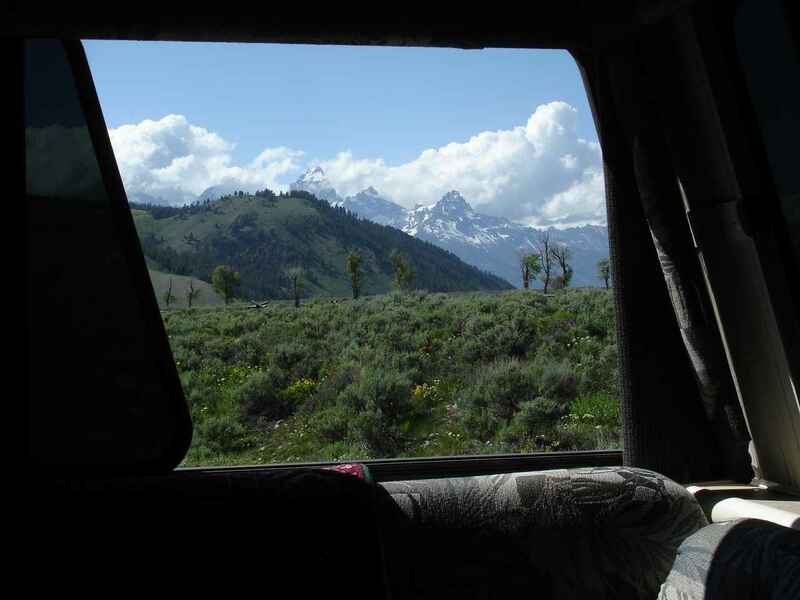 This is the view from our campsite in Gros Ventre Campground. And this is the view from our bunk window at sunrise. Please double click to get the full effect. This has to be one of our favorite campsites!! That was one of our favorite places, too. Have you found the trail to the river behind the campground? We saw beavers there almost every evening. Any other Lazy Daze there?